Dr. Bradley J. Longfield speaks at the PHS Luncheon, June 17, 2014. After an opening prayer by the Reverend Paul Watermulder, outgoing PHS Board of Directors’ Chair, and an introduction by Nancy Taylor, co-Acting Director of PHS, Dr. Longfield stated the central premise of his talk and of his recently published book, Presbyterians and American Culture: A History—that Presbyterianism has exerted a significant and sustained influence on American culture, and vice-versa, with the Church sometimes shaping the national culture, and the culture sometimes having the larger impact on the Church’s theology, approaches to social issues, and polity, especially in recent times. 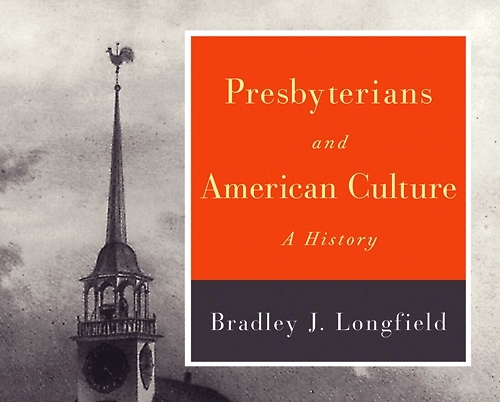 Dr. Longfield used slides to highlight seminal ideas and figures in the story of American Presbyterianism. John Witherspoon, Gilbert Tennent, Elias Boudinot, James Henry Thornwell, A.T. Pierson, Henry Sloan Coffin, J. Gresham Machen, Francis P. Miller, Henrietta Mears, and Eugene Carson Blake were some of the more prominent theologians, educators, and other church figures who took strong stands regarding revivals, abolitionism, civil rights, and other questions of “order versus freedom”—what role the Church should play, if any, in addressing the perceived ills of society. Dr. Longfield explained how different leaders influenced separate traditions within the faith. Thornwell’s Antebellum defense of “spirituality first” set a conservative precedent that J. Gresham Machen, Francis P. Miller, and Henrietta Mears followed as they promoted Neo-Orthodoxy and Neo-Evangelicalism in the 20th century. Individuals more supportive of church benevolent societies and boards of mission advanced the work of humanitarian, and sometimes ecumenical, ministries. Missionaries such as William Henry Sheppard and Pearl S. Buck—“the basketball players of their day,” Dr. Longfield joked—enjoyed wide celebrity inside and outside the Church despite what were at times controversial stances. Lay figures such as John Foster Dulles and Catherine Marshall emphasized the ways “American Christian faith” could positively affect the non-Christian world. 13 hours 10 min ago. Today’s #HistoricalFigureFriday honors Reverend James Patriot Wilson. Born in 1769 in Lewes, Delaware Wilson went on to graduate from the University of Pennsylvania in 1788. He initially studied law and was admitted to the Bar but the unexpected death of both his wife and brother led him to a religious path. He was ordained as pastor of the Presbyterian Church in Lewes in 1804 and in 1806 he accepted a call to lead the First Presbyterian Church in Philadelphia. He resigned as a much celebrated pastor in the spring of 1830 before he died December 9th 1830. Our portrait of Reverend Wilson was painted in 1807 by none other than James Peale the younger brother of Charles Willson Peale. This oil on canvas painting represents one of the many large portraits James Peale completed after he shifted away from miniatures. To see more works by James Peale visit PAFA The Pennsylvania Academy of the Fine Arts or the Philadelphia Museum of Art.